The Doris Day Animal Foundation, a national non-profit organization founded by the legendary actress and animal welfare advocate, has provided a grant to Pets Uniting People Society of Tremont City, Ohio, for use with their spay/neuter efforts. “The grant will assist our PUPS’ program by funding approximately 50 cats for surgeries and rabies shots.” says Carolyn Hayes, PUPS’ Director. Since December, 2010, 150 cats from 7 cat colonies throughout the county, were neutered or spayed through the PUPS’ program. Of these 150 cats, 50 kittens were people-friendly allowing them to be adopted into loving homes. In addition, with the “PUPS Digest”, educational and awareness efforts send positive messages to our county officials and the general public that cat colonies can be controlled and retained with healthy, inoculated cats so that they may live peaceably within our community. We thank Miss Day and her Foundation for assisting us in giving so many cats a second chance at life. Other grants which the Foundation has provided include funding for college scholarships, programs for senior citizens to care for their pets, programs for rescue dogs, Kevlar vests for service dogs, rescues of greyhounds, run-sheds for horses, reduced adoption fees for seniors to adopt senior pets, wildlife sanctuary assistance, and reduced cost spay/neuter programs as well as a feral cat TNR (trap, neuter & return) program, to name but a few. 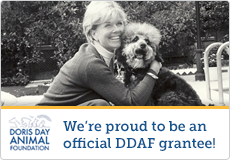 The Doris Day Animal Foundation, www.ddaf.org, has the simple and straightforward mission of helping animals and those who love them. DDAF provides funding to 501(c)(3) nonprofit organizations for animal welfare work with specific low-overhead programs, including animal rescue, lifetime care for search and rescue dogs, helping people care for their animals, assisting with care for horses, paying for spay/neuters and other animal-related needs.